404-412 E. 104 St. N. Y.
William Hauptmann (1856-1921?) was an immigrant from Germany. According to a passport application filed in 1912, he was born 2 Nov. 1856 in Baden [? ], Germany. His naturalization petition dated 20 Sept. 1892 says that he arrived in the U. S. May 1886. He was in business in New York as an iron founder from 1892 to 1919. Initially he was in business with Thomas F. Brady as Brady & Hauptmann at 707 1st Avenue near 40th St. This foundry was also known as the Mutual Iron Works, and in 1899 they moved to 410 E. 104th St.
Hauptmann's partner, Thomas F. Brady (1860-?) was recorded in the 1900 U. S. Census, age 40, born May 1860, Ireland, immigrated 1884. He also appears in the 1905 New York State Census, age 45, born Ireland, living at 1538 Madison Avenue, Manhattan. Thomas F. Brady disappeared from city directories after 1906. Brady & Hauptman / Mutual Iron Works became Wm. Hauptmann / Mutual Iron Works in 1906. Wm. Hauptmann Iron Works were in business until 1919. In 1899 the Annual Report of the Factory Inspectors of the State of New York recorded Mutual Iron Works as employing an average of 37 male employees who worked 54 hours of labor. A year later (1900) the next annual report said the business employed an average of 75 male employees working the same 54 hours. In 1903 a fire destroyed the Brady and Hauptmann foundry: "One of the hottest and most spectacular fires that have occurred in Harlem for a long time last night destroyed the four factory buildings at 406-412 East One Hundred and Fourth Street. ... The firms burned out were: The Mutual Iron Works (Brady & Hauptman, proprietors) ...," New York Times, 6 Aug. 1903, pg. 1. That same year plans were filed with the New York City Dept. of Buildings for a five- and six-story loft building, 119.8 by 100.11 feet, at 406-412 E. 104th St. Brady & Hauptmann were rebuilding. It was also around 1903 that William Hauptmann became involved in real estate under the business name East End Realty Corporation. In 1906 this business was cited in The National Corporation Reporter, Feb. 1906, with officers William Hauptmann, William A. Hanisch and Philip H. Krausch. William A. Hanisch (1851-1940) was a "stair builder" who lived for many years at 1166 Forest Ave., the Bronx. He died 25 April 1940, age 88. Philip H. Krausch (1865-?) was born 25 August 1865 in Hessen, Darmstadt, Germany, immigrated to the U. S. in 1884 and became a naturalized citizen in 1891. William Hauptmann also had a real estate company known as Hauptmann Realty Co., where his partner was his son, Ernest William Hauptmann (1884-?). Both this company and the East End Realty Corp. were located at the same 404-412 E. 104th St. that housed William Hauptman Iron, and Mutual Iron Works. 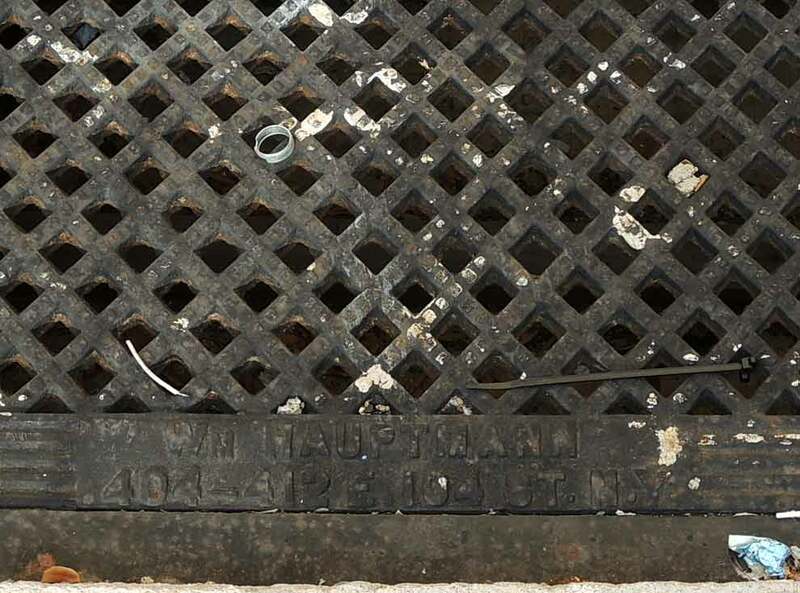 In the 1910s William Hauptman and the Mutual Iron Works were cited several times for contract awards to provide ornamental iron on building projects. In 1912 this included "700 tons for the Robertson apartment, Ninety-fifth street and Broadway, to William Hauptmann Iron Works." In 1914: "Apartment: 6 sty, 24x90, $42,000, N.E. Cor. St. Nicholas av. & 152d st. Archt. Henry A. Koelbe, 114 E. 28th St. ... Orn. iron to Mutual Iron Works, 410 E. 104th st."